It’s tough for things to be gloomy in Southern California. The weather is picturesque, and you can usually count on one hand how many times it rains in a year. But if you’re a fan of the Anaheim Ducks, the beginning of this season has been more of a storm than anything else. Through sixteen games, Anaheim has posted a 5-7-4 record. That’s not a terrible record if you’re a team in the midst of a rebuild, but not for a team that was a heavy favorite to win the Western Conference. The Ducks were within one game of reaching the Stanley Cup Final last year, and if they hope to get close again, they need to take a page from the Columbus Blue Jackets’ book and fire their coach while it’s still early in the season. General Manager Bob Murray needs to say good bye to Head Coach Bruce Boudreau. Only two weeks ago, Murray stated that there wouldn’t be any drastic changes, despite getting off to a 1-7-2 start. You may look at their current record and say “Hey, they’ve gone 4-0-2 since then, that’s pretty good”. But both of those overtime losses came at home against the overachieving Coyotes and the lowly Oilers (twice blowing a one-goal lead in the third period against Edmonton). Just when it looked like the real Ducks were starting to show up, they had two bad losses to follow the four game winning streak. When teams that are championship contenders are up and down, it’s the job of the coach to find a way to settle the ship. Whether that’s fair or not, that’s how it works, and it may be time for a different voice to lead the locker room. This isn’t the first time that a team’s lack of success under Boudreau has been traced back to him at the NHL level. The Washington Capitals never got past the second round of the playoffs under him in four full seasons, before being fired early in his fifth season in DC. Whether that was his fault or not, as the old adage goes “You can’t fire the team, so you fire the coach”. Since he took over in Anaheim, he lost in seven games to Detroit in the first round, followed that up with a seven game series loss to Los Angeles in the second round, and then lost to Chicago in seven games in the Conference Finals last season. Yes there’s been progress each playoff run, but the step back the team has taken to start the 2015 season is alarming. You can’t tell me that the losses of Matt Beleskey, Francois Beauchemin, and Emerson Etem are having this much of an impact on this squad. They were without Ryan Getzlaf for a few games due to an appendectomy, but it’s not like things were going well before that point either. A pet peeve of mine is when a fanbase wants a coach fired, but has no logical replacement in mind to fill the vacancy. Guy Boucher might be the best available coach without a job at the moment, but the Ducks wouldn’t have to look outside of the franchise for a replacement with experience. Former Senators Bench Boss Paul MacLean is on the Anaheim staff. He would be a good balance of someone that has NHL experience, knows the team, and would provide some new leadership. Sometimes getting away from home in situations like this is what the team needs to get going, and they’ll get that opportunity with a four game road trip in the Southeast after a Friday night home game against the Islanders. 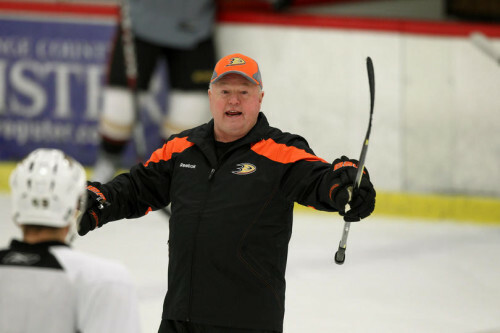 If the Ducks can’t find a way to come up with at least six points in their next five games, it could be Boudreau’s last flight with the Ducks.